7 ranges (FG-275 0.5Hz to 5MHz, FG-273A 0.2Hz to 2MHz). the digital circuit experiment had been made possible. 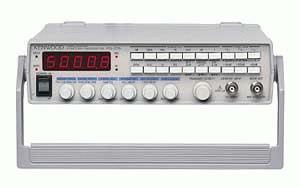 has ability of an independent start and stop frequency setting. An external voltage (0 to 10V) can control the output frequency.